From Contrarian Outlook: One of the greatest things about closed-end funds (CEFs) is that they often cost less than they’re really worth. And no, I’m not basing that on some obscure metric–I’m literally talking about the difference between the market price of the assets the fund owns and the market price of the fund itself. It works like this: a CEF can trade for, say, $9.90, even though all the assets the fund holds (known as the net asset value, or NAV) are worth $10. Believe it or not, this happens a lot–it’s exactly how billionaire investors make big money in CEFs. Take, for instance, Boaz Weinstein of Saba Capital Management. He’s a pretty big name on Wall Street for one reason: he was the guy who took down the so-called “London Whale,” a reckless trader with JPMorgan Chase & Co. (JPM) who racked up $6 billion in losses on phenomenally dumb bets. Weinstein was the guy on the other side of those bets. And now Weinstein has another lopsided Wall Street mistake in his crosshairs, and it has everything to do with closed-end funds. As I told you last year, Weinstein stated that he was betting big on CEFs, spotting an opportunity to buy these funds, which were heavily discounted at the time, and waiting for the market to clue in to the big profits they offered. Even after the recent volatility, these funds are up around 15% from a year ago. 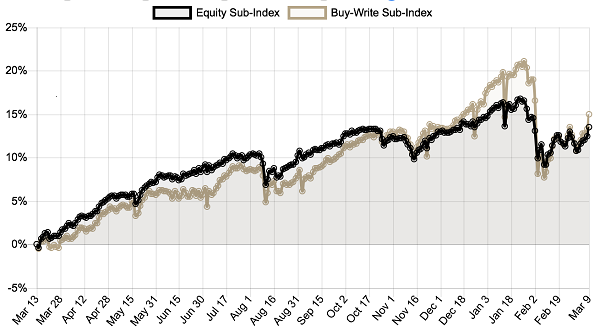 The best news is that there are still a lot of discounted CEFs floating around, despite this gain, so if you want to get in on the action, you’re not too late. Which brings me to the 2 CEFs I’ll show you now. 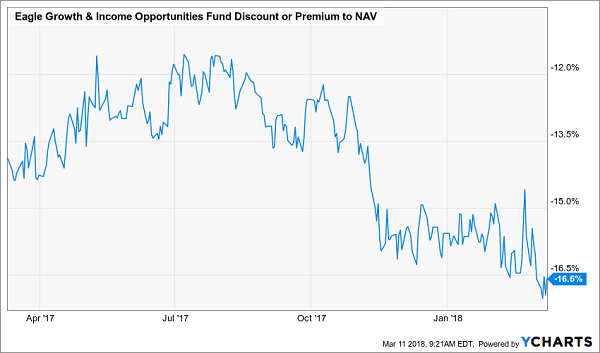 Let’s start with the Eagle Growth & Income Opportunities Fund (EGIF), which is a tiny, $111.5-million fund trading at a huge 16.8% discount to NAV. If you think this is because EGIF is holding dangerous stuff, think again; many holdings are value stocks with strong cash flows, like AT&T (T), Phillip Morris (PM) and Cisco Systems (CSCO). Buy these stocks on the open market or hold them through a value-stock mutual fund or ETF and you’ll get $100 worth of stocks for every $100 you put in. But with EGIF, you’ll get $100 of stocks for $83.20, thanks to that absurd discount to NAV. Why else should you consider EGIF now? So if you were to buy now and wait for the fund to trade at par, you’d be looking at a 20% return. Or if you’re more impatient, just wait for this CEF to go back to where it was less than a year ago. You’ll still get a nice 5.6% return. And while you wait, you can enjoy EGIF’s 5.6% dividend stream. A second fund to consider is the GDL Fund (GDL), run by famed value investor Mario Gabelli. Mario is a seasoned Wall Street billionaire not unlike Warren Buffet; using time-tested value-investing principles, his team looks for discounted stocks around the world and bets big on them. 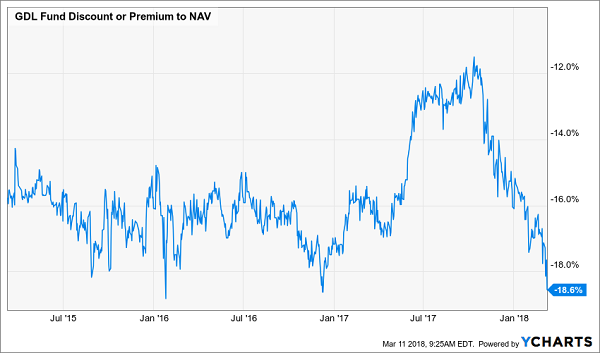 But despite all that expertise, GDL trades at a ridiculous 18.6% discount to NAV! With $81.40 you’ll get $100 worth of stocks in high-quality global companies like Time Warner (TWX), which is likely to pop soon when it merges with AT&T, as well as Parmalat (PLT), the Italian dairy producer, which has a large share of the EU market, and Advanced Accelerator Applications (AAAP), which drug-making giant Novartis (NVS) is seeking to acquire. Obviously, Gabelli’s team knows their stuff. Buying now would get you this value portfolio at a huge discount. Wait for its discount to revert to where it was a few months ago, and you’ve got 8.1% upside. Keep holding on and collecting the 4.2% dividend stream and you’ll likely rack up even more gains, thanks to GDL’s strong and underappreciated portfolio. These are far from the only cheap CEFs out there. Right now, I’m pounding the table on 4 other funds that are even better places for your money! The discounts on these 4 off-the-radar income powerhouses are off the charts! That locks us in for even BIGGER upside–I’m talking 20% as a conservative baseline. You see, these 4 under-the-radar CEFs also throw off 7.6% dividends, on average, with the highest-yielder of the bunch dropping a rock-steady 8.1% into your pocket–year in and year out. Don’t miss out on this one-time opportunity for massive income and predictable gains. Simply CLICK HERE and I’ll share these 4 funds’ names, tickers, buy-under prices and more with you now.